In the ten months since a supervolcano obliterated much of the United States, society has fallen apart. The cannibalism that was hinted at in Ashfall has become the way of life for massive gangs who prowl the country, murdering and trading goods (namely: weapons, drugs, and women). Alex and Darla have lived fairly comfortably at his uncle’s farm in Illinois, but his parents have not returned from their search for him. When they set out on their mission, they learn that the road is far more dangerous than they remembered. Along the way, they make a few friends, many enemies, and need to be stronger than ever. Mullin has subtly developed his characters between novels. Alex is no longer a weakling who relies on Darla for everything. He is strong and self-assured, with a maturity beyond his years. Darla remains a role model, intelligent and practical. Their relationship has progressed and become a partnership similar to a marriage. The new characters are equally fascinating: Alyssa was held captive by a gang of flensers (cannibals) and her brother Ben is autistic, brilliant when it comes to anything military-related, but challenged by being touched and social interactions. I wanted to learn more about all the characters and appreciated the research that went into making them realistic. While Mullin’s research was extensive, at times the descriptions of their tasks dragged on. For example, Mullin expounded for several pages about how the characters moved a heavy propane tank to another location. This helped emphasize the difficulty of everything they had to do, but it did not add to the story. Ashen Winter could have been a hundred pages shorter if repeat arguments and menial chores were not retold in such specific detail. On the other hand, this writing style pays off during the many action scenes, which Mullin does not feel the need to rush. Readers can rest assured that there will always be another chase scene, firefight, or gruesome discovery ahead. 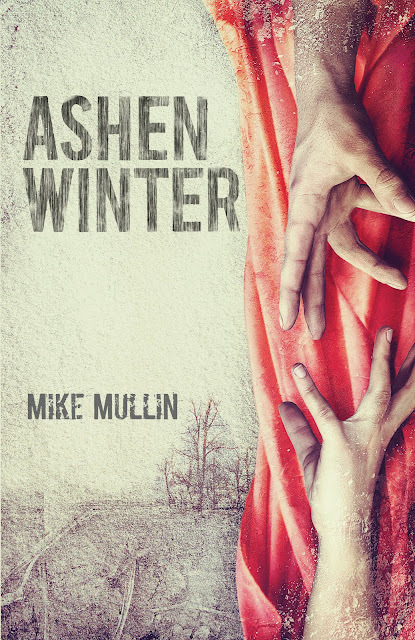 The cover of Ashen Winter is perfect: it's dramatic, depicts a vital scene from the novel, and also resembles tendons and muscles when seen in miniature. With Ashfall, I felt the ending wrapped up fairly neatly and did not feel the urgency to read the sequel. This makes me laugh now, for as soon as I saw Ashen Winter was available, I snatched it up. Now I realize that Mullin is content with tying up one adventure while gently setting the stage for the next. I will be able to sleep easily until the third book in the series is released, but I will also be jumping to read it as soon as it is published.